This is a 2005 SEADOO 3D PWC STAND UP JET SKI with only 5 hrs. The jetski looks brand new and it ride like a brand new ski should. 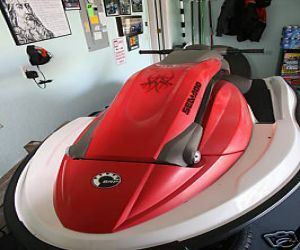 This 2005 SeaDoo 3D PWC is in very good condition and runs like new with a top speed of 55 -60 mph. Engine size is 780 2cc. This SeaDoo Stand Up Jetski has been stored on a trailer in a garage. It has been flushed and cleaned each time after it has been on the water. The battery is brand new. This Sea Doo Jetski comes with the yacht club trailer in superb condition. It also comes with manual, one key, hand tools and brand new Sea Doo fire extinguisher. This 2005 SEADOO 3D PWC UP JET SKI in black, read and white has no dents, dings or scratches. This SeaDoo 3d model can be ridden different ways; standing up, kneeling down, sitting on a jump seat that folds under the handle bars or sitting with optional car seat, which is included.